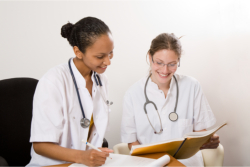 Clinical Medical Assistants (CMA) are able to complete administrative and clinical tasks in the offices of physicians, podiatrists, chiropractors, and other healthcare practitioners. Duties of a CMA include: performing routine tasks and procedures such as measuring patients’ vital signs, administering medications and injections, recording information in medical records, preparing and handling medical instruments and supplies, collecting and preparing specimens of bodily fluids and tissues for laboratory testing. The CMA program is 526 hrs and it consists of five (5) courses as outline below. If the first (1st) class registering for is Medication Aide, and/or C.N.A. II, an additional requirement applies. *Need to satisfy these requirements above before registering for this program. After completion of these courses, students will then complete 200 hours (around five (5) weeks or so) of internship for completion of the CMA program. *Note: If any of the above classes were completed at another institution, student must contact the school before registering for this program. After the completion of all 5 courses, it’s respective clinical’s & The CMA Internship (200 hours), students will be eligible to take the NHA Exam for CMA either at Chosen Healthcare Institute Inc. or at the PSI testing center. Cost: Follow the individual course costs for each course listed above.